My youngest son is an avid climber and boulderer and he wanted a hangboard in his room to strengthen is arm, hands and fingers etc. I had a lot of wood left from previous projects so I used some of it to build the hangboard. After searching the internet and seeing a lot of examples we came up with the drawing below. My son using his newly acquired hangboard for training. The backplate and frontplate are made of 12 mm (1/2") plywood while the beams and support beams are made of 30mm (1 1/4") scaffolding wood. The rails are of pine wood of various thickness, 1 1/4" being the thickest and 18mm (3/4") the thinnest. The support beams strengthen the construction considerably. Here are the parts that are needed for this build. Building the board is straight forward. First I'd cut the plywood to the plates with the size indicated above. Next I'd cut the scaffolding wood for the beams. I used a simple Dremel DSM20 for this but any circular saw will do. Lastly I'd cut the pinewood beams. I used a router to make a radius on one side of the beams. This radius ensures that the beams are easier on the hands. With all the pieces cut, I drilled the holes in the backplate, frontplate and rails. Next I assembled all the parts. Starting with the backplate and the beams. 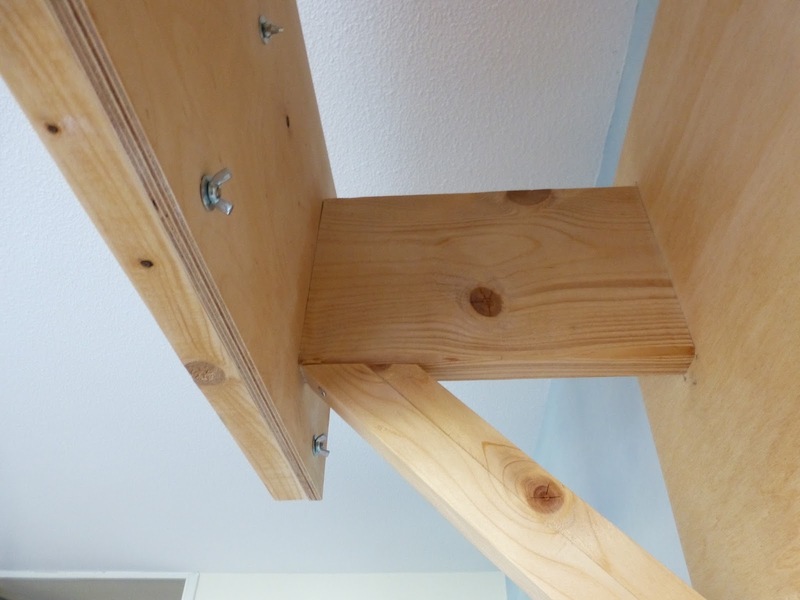 I used a 3mm drill before fastening the beams and the plywood with the twinfast screws. This avoids that the wood splits open. The beam and supportbeam were fastened with a single twinfast screw. Next I fastened the frontplate to the beams again using twinfast screws. 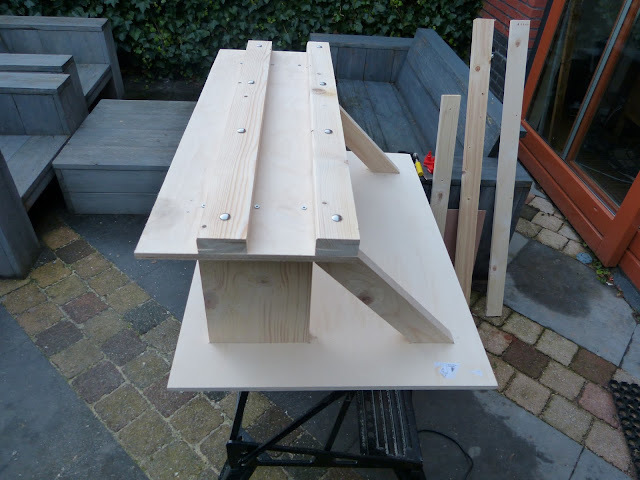 To finish the hangboard I fastened the beams to the frontplate using the carriage bolts and wingnuts. Lastly I applied a transparent oil to the hangboard to provide protection It's more pleasing to look at too. Fastening the hangboard to the wall may differ from situation to situation but since we have concrete walls I used four large wall plugs (Fisher brand). 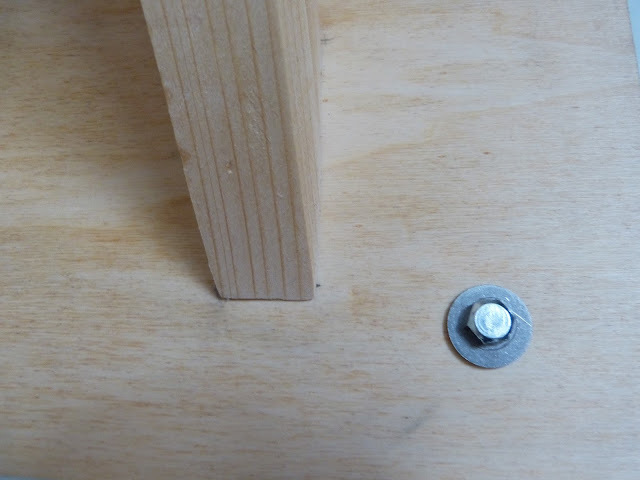 The board was then attached to the wall using the lag screws with washers to protect the wood. Assembling the hangboard. Clamps of various size are very useful in situations like this. The finished hangboard attached to concrete wall with four large wall plugs, lag screws and washers. 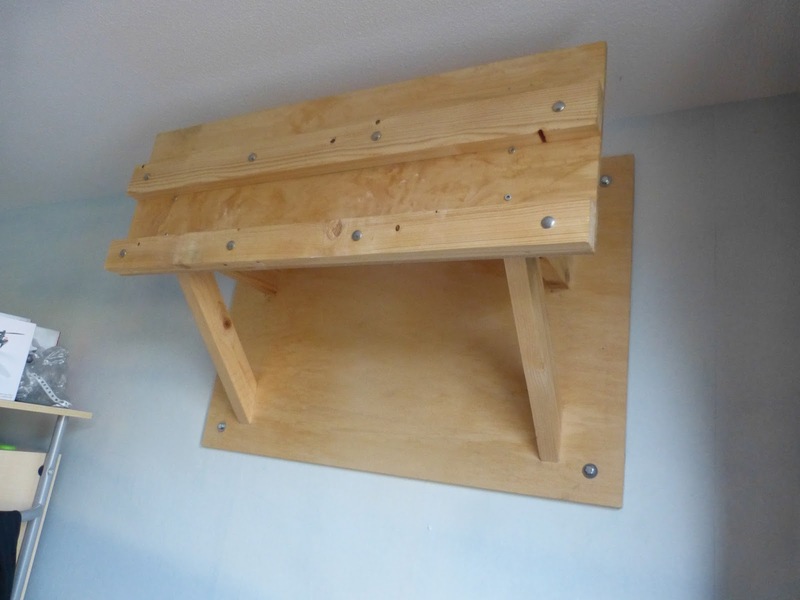 Inside view of the hangboard. By removing four wingnuts the beams can be exchanged for smaller of wider ones. Detailed view of the lag screw and washer on the plywood backplate. 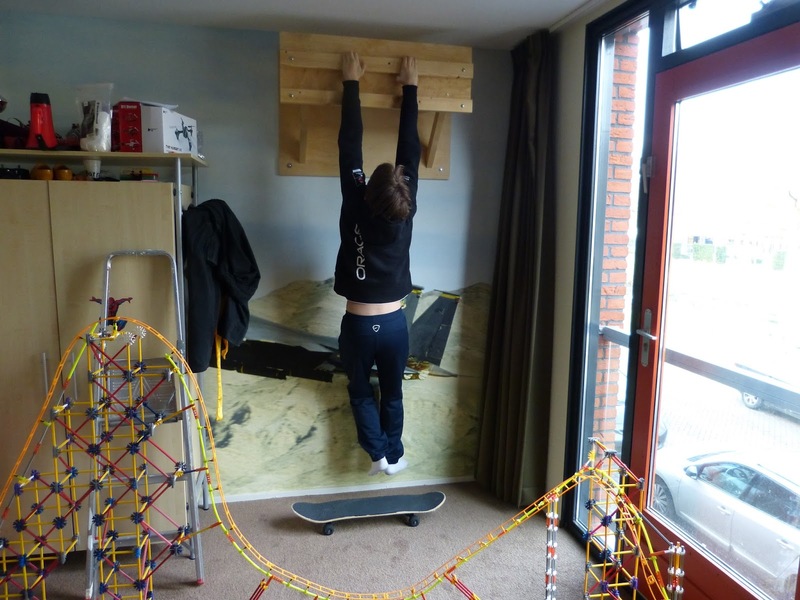 The hangboard proves to be strong enough for my son (he weights approximately 65kg). I tried it myself (I'm 90kg) but my fingers just aren't strong enough to keep my weight. Nevertheless I'm confident that the construction is more than enough to keep a weight well over 65kg. As for esthetics the board looks pretty good (for a hangboard that is).